This morning it was incredibly rainy. I may have used the term "power washing" to describe how fast the water was coming down. Since Norfolk is below sea level, we frequently experience some minor flooding when it rains pretty hard. This morning was no exception. There were cars stranded all over, and some places had almost two feet of standing water! I put on my trusty rain boots before I headed out the door. I've had them for a bunch of years, and they are just brown checkered pattern. But they are so handy to have for situations like these. 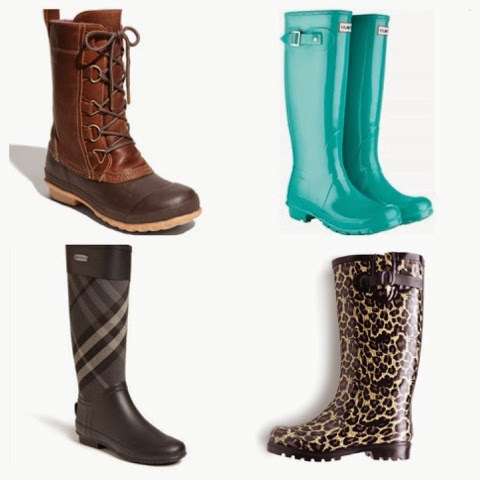 This is my rainboot wish list. I would for sure, 100% wear any of the boots below. Sources (clockwise from Top Right): one, two, three, four. They are all very different, so I think I might need all of them. Who votes yes? Sidenote: Today I'm linking up my upcycled Toms shoes to Craft Dictator, Whipperberry, and Nancherrow. Go visit!